We think its pretty cool that you are a local independent business. EyeHeartLocal is a national campaign that works to connect consumers with a local independent eye care professionals dedicated to providing the best eye care and eyewear. Consumers like to support their local businesses. We help them differentiate your business from national chains and put you right where they are looking; online and on their mobile devices. Did we mention the program is for Independents Only. There is no charge to participate. 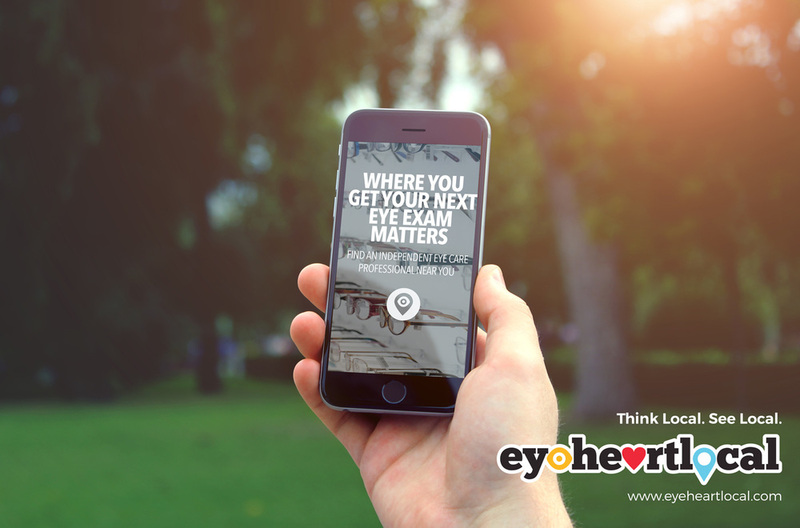 EyeHeartLocal is a consumer campaign that promotes independent eye care businesses to their local markets while helping customers connect with you. The campaign is for independent eye care businesses only and helps you differentiate your business through the value and benefits you provide being locally owned and operated. Through our online marketing, social media campaigns and digital resources, EyeHeartLocal helps you stand out where your customers are looking for you; online, on search engines and on their mobile devices. The campaign is designed to promote your business, build awareness within your local market and increase business. Easy. Sign up above and fill out the questionnaire. We immediately get started helping your customers better find you. Did you know 78% of local-mobile searches result in offline purchases? That’s real business! Get in front of your customers when, where and how they are looking for their next eyewear purchase or eye exam. Does it cost anything to participate with EyeHeartLocal? No. There is no cost associated with participating with EyeHeartLocal. There are additional services or products offered by Optical Resources that may have corresponding costs, such as our custom marketing services. What if I change my mind and do not want to participate? We'd hate to see you go but there is no required commitment. You will no longer have access to Vision Made Locally resources or the use of its branding. Click here to have your listing removed from the EyeHeartLocal web presence. I have more than one location. Can I have them all listed? Yes. Just fill out the sign up form for each location separately. Can only independent eye care businesses participate? Yes. EyeHeartLocal is specifically designed for independent eye care businesses. This does not include national chains, franchises or international companies. What do you consider as an "Independent Eye Care Business"
The business should be independently operated. The owners should have full autonomy to make decisions about their business, including sourcing, operations, distribution, marketing, and technology. The majority of the ownership, the people who have the biggest stake in its success, live in the local area or have a vested interest in the success of the community it belongs to. Most franchises are not considered independent even if locally owned.